With more than 500,000 new cases and more than 260,000 deaths reported annually, cervical cancer is still among the most common cancers in women worldwide. In Europe and North America, 67,000 and 14,000 new cases and 28,000 and 7,100 deaths were recorded, respectively, in 2012. On the other hand, in Europe and North America ca 7 million women annually receive an abnormal Pap smear result requiring medical follow-up when getting screened for cervical cancer. Only few of these women have a cervical disease deserving treatment. Microscopy of Pap smears from (left) a healthy patient and (right) a patient with high-grade dysplasia CIN3. Not always the small tumor cells can be observed so clearly. Cervical cancer alsmost always is evoked by infection with so-called human papillomaviruses (HPV). HPV infecten is supposed to be the the most common sexually transmitted infection. In most cases the infection does not cause any symptoms, and it is cleared within 1-2 years. More than 150 HPV types are characterized to date. 14 of these are high-risk types, since persistent infection with any of these types may lead to cancer. Since 2007, vaccinations are available against the two HPV types which are most frequently found in cervical cancer tissue. Therefore, participation in screening programs is still required. The so-called transformation zone is located at the portio and cervix. In case of small lesions, HPV may enter the cells and persist. It may take many years from infection with HPV to carcinogenesis. Therefore the chance to detect the cancer or it’s precursors early enough, is quite high. 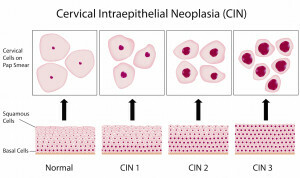 Cervical cancer develops slowly, and several precancerous stages, so-called dysplasias or neoplasias, can be diagnosed. However, only few of these dysplasias progress to cancer, most of them heal spontaneously. GynTect offers the chance to detect those dysplasias that have a high potential to progress to cancer. In all other cases, a strategy of watchful waiting may help to avoid surgery. 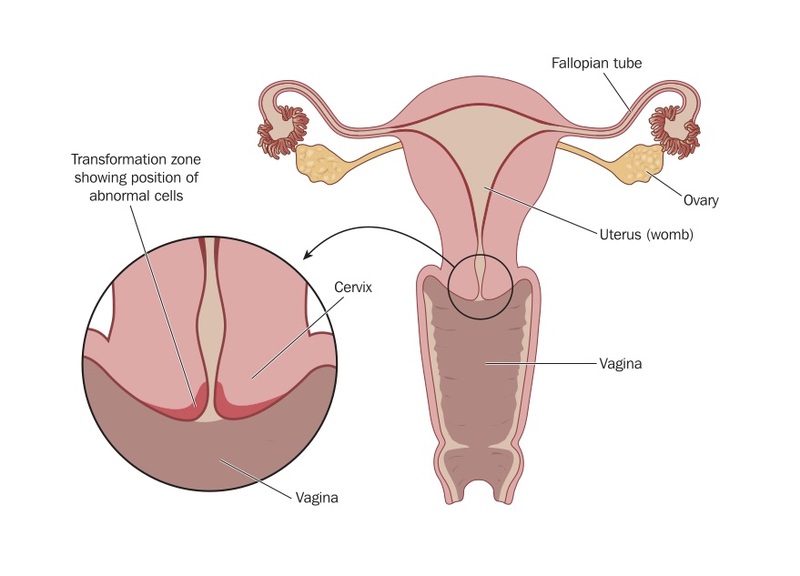 This is of prime importance especially for women in their reproductive age: complications during pregnancy such as higher risk for preterm birth or even perinatal death may be a consequence of surgery. Cellular changes during carcinogenesis. 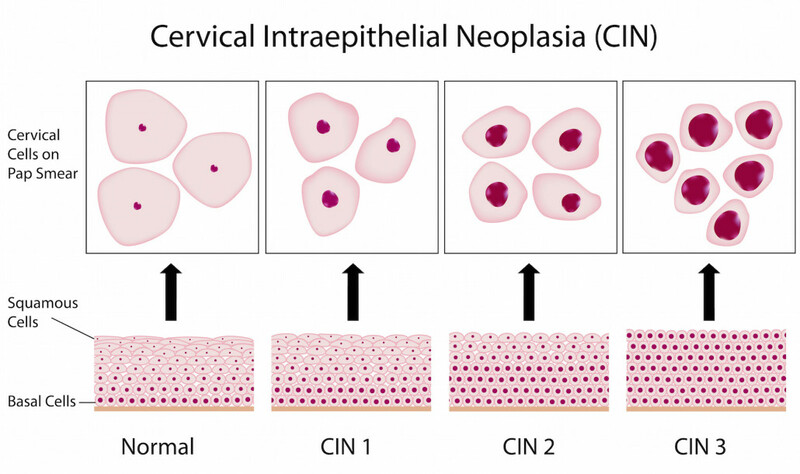 In early stages only few neoplastic cells are found in the basal cell layer, whereas in later stages such as CIN3 or carcinoma in situ all cell layers are affected.